This topic contains 0 replies, has 1 voice, and was last updated by Charles Mayberry 1 year, 5 months ago. I just purchased my first Amazon Echo Dot, whom one addresses as ‘Alexa’. The process for hooking it up to the local Wi-Fi was easy and downloading the App (which you use to set it up) to your phone, iPad or other device is even easier. Other than asking Siri for directions when driving, I have not interfaced much with computer technology by voice. My expectations of Alexa were high, however. The long and the short of it is that Alexa is well worth the $40 or so (for the basic Dot) and it is fun getting to know the technology. I won’t do a sales pitch here, but you can request the time, weather, news, recipes, books, music, turn on the lights in the room, and much more by simple voice commands. Alexa will answer you and provide the info or content requested. For example, I now set my wake-up alarm by saying, “Alexa, Set Alarm for 6:30 AM.” Much easier than clicking through my cell phone (my old ‘alarm clock’) to find the settings and change the alarm, or getting out of bed to find the phone. Another example is the two hours I spent recently loading more than 500 of my favorite songs and music for Alexa to open and play on request. An entirely enjoyable experience sitting back and thinking of my favorite music from years past. Amazon has, by their own account, more than a million pieces of music to choose from. My tastes ran though several genres and a wide time span, picking the songs and the performers of those songs that I wanted. The original “Me and Bobbie McGee” sung by Chris Kristofferson (the composer and lyricist) was available. “Adagio for Strings” by Samuel Barber, was too as well as, “Garryowen” by the US Army Band Strings. I think Amazon is not kidding about how much music they have. By the way, audio books are just as easily obtained. 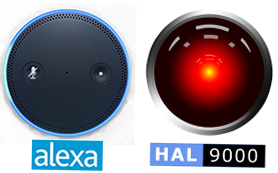 My current chief complaints about Alexa are perhaps unfair due to the newness of the device and the fact that I am stuck in a place in history where this technology is just not what the imagination says it should be. First, one has to memorize voice commands to give Alexa for info or songs or books or tasks that she will perform. When I expanded the number of tasks she performs and the variety of info that I obtain with her help, then I could not remember the commands for those functions that I use infrequently. Second and related to my first complaint, is that Alexa often does not offer much help when you struggle with your ‘search statement’. The nice pleasant voice interface notwithstanding, one is actually searching databases when talking to Alexa. And garbled search statements produce garbled results or none when interfacing with databases. When the correct words are not spoken, Alexa answers with a curt, “Sorry! I don’t know that.” Not good reference librarianship….! My hopes are that this is something that can be fixed. It is a UX issue, not a technology issue, I think. The programmers should ensure that Alexa picks out key words that she does understand and comes up with options for you to refine your search. Google does this with their, “Did you mean…? text below the search box when a search word is misspelled. Don’t miss the article linked below for examples of how Alexa is being used at libraries.